This article gives an unbiased review of Procus Pro VR Headset along with its specifications and price. Know all the Pros and Cons of Pro VR in this article. Procus is known for manufacturing some decent quality of budget VR including Procus One and Procus Brat. 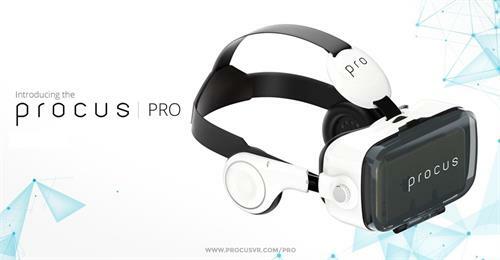 This time Procus is back with a premium VR Headset called Procus Pro. So, lets understand how Procus Pro is different and a game changer in the VR Headset market. Procus Pro is available at Amazon at 2,999 INR which is lowest in comparison to price at other e-commerce sites. Before moving on to the specifications you may check the qualities that makes a VR Box and Headset a best buy. Its a premium quality VR with new and innovative design which looks decent. It is made out of plastic and leather and is very light in weight. With inbuilt headphone, Procus Pro gives the feeling of owning a precious headset worth more than 5000 INR. Procus Pro has some latest PMMA technology based HD optical lenses with 42 mm diameter to give you the best experience. The lenses are crystal clear along with a large FOV surpassing 120 degree and hence it offers a much wider screen and gives you the feeling of an I-Max theater in the comfort of your own home. To provide you with a more immersive VR experience, Procus Pro owns an adjustable pair of inbuilt headphone to enhance your thrill of diving in the world of virtual reality. Headphones are covered with soft foam for noise cancellation and fits easily over the ears for long-hour use. In order to ease you with the control of your phone without removing it from the headset, Procus Pro has an inbuilt clicker which can be used to navigate between different apps and you can easily decrease and increase the volume button of your phone. Other futures include adjustable mobile phone holder panel which is also made to dissipates the heat of your smartphone over long duration of use. Soft foam cushioning around the headset allow you to wear the headset comfortably for long hours and you can not feel irritating even when you watch a full 2 hour movie. Procus Pro is no doubt one of the best VR headset in its class. By providing inbuilt headphone Procus has tried to provide a massive immersive experience to its users in the world of virtual reality and the best part is that they have been successful in their effort to great extent. However, you can not expect the same experience like Samsung Gear VR or HTC Vibe because it is not possible for any headset in this price range. But this VR headset is definitely a good substitute of those precious headsets if you are not able to afford Gear VR or Vibe. Please keep one thing in mind that the picture quality in a VR headset largely depends up on the pixel density of your smartphone. If your smartphone has a low pixel density then you can face the problem of blurr, distorted and unclear image. The problem is not because of headset, it is mainly due to poor display quality of smartphone or using poor quality videos. If you are watching a video or a movie in a VR headset then make sure that video quality is full-HD according to your smartphone display. Now, most of the smartphones comes with full HD display, so you need not worry about the quality of display if you are having a latest smartphone. Also make sure that your phone has gyroscope sensor, without this sensor you can enjoy VR to its fullest. You won't be able to watch 360 videos and some high-end VR games. If you have some more questions and queries, you can comment below. We will be pleased to help you.